Hershey recently announced a comprehensive plan to help save lives and make better chocolate. They are working with several partners to improve sustainable farming practices, reduce child labor violations and develop stronger communities in areas where cocoa farming is a major part of the economy. The world famous chocolate company hopes to improve living conditions in these areas so farmers can improve yield and sustainability of their cocoa crop for decades to come. Bulk candy bars lovers everywhere should approve of that. Yes, it will mean continued enjoyment of Hershey’s chocolate candy down the line, but it will also guide the conditions under which the cocoa is produced to improve, and lives could be saved because of it. Most of the cocoa in the world, over 70 percent, is grown in West Africa. This also happens to be one of the places in the most need of economic empowerment and community development. Conditions in farming communities in West Africa have been pretty bad. Child labor and poor health and education structures have meant worsening conditions in recent years. Hershey has decided that it is in everyone’s best interest for them to step forward and do something about it. Through strategic partnerships, Hershey is adopting a multifaceted plan that it estimates will take five years and over $10 million to develop. The focus will be on accelerating farmer and family development by working with agriculture experts, community developers and governments to educate and encourage farmers. Providing resources to farmers is the first, and seemingly most important, step in the process. An increase in cocoa yield of 50-100% is estimated for farmers who will be a part of Hershey’s program. By using the resources Hershey will provide, which includes not only knowledge of best practices but high-yield seedlings and organic fertilization, farmers could see a large boost in their family income. In regions where farming income is 50 percent of the local economy, the implications for such growth are very promising. Working with partners like the Rainforest Alliance and Source Trust, Hershey will set up community based organizations where farmers can build community relationships, source improved planting material and get financing for further improvements to their farms. In an effort to curb the unsafe and illegal child labor practices in the region, inspectors will monitor the practices of farmers who provide cocoa to Hershey. Through the Rainforest Alliance and local government, training programs will be set up to increase school attendance and improve schools. In summing up, Hershey has decided to get involved in an area of the world with which it already has a symbiotic relationship. Hershey provides a large market in which farmers can sell their products and farmers produce the cocoa beans that are the very fabric of their chocolate candy products. Under this plan, farmers should make more money, communities develop, health and education improve, and children will be safer and healthier. 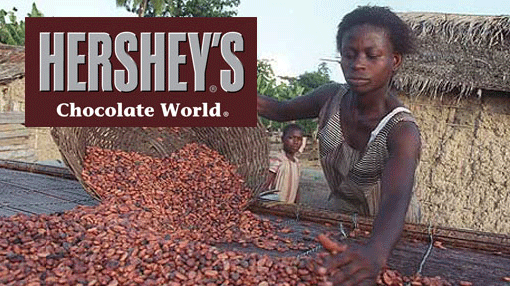 Support Hershey in their efforts to improve cocoa farming conditions. Buy Hershey’s chocolate candy from the online bulk candy store, candystore.com.